It isn’t everyday when a new luxury fashion store, featuring well known and emerging designer labels, opens in New York. This December, the Murray Hill section of Manhattan became home to the Dover Street Market emporium, which has locations in London and Ginza, Japan. At first I thought this endeavor was a risky proposition. After all, why establish a fashion destination in a sleepy neighborhood where track sets, knit caps, Tory Burch and lower-end white Nikes are the norm? Or perhaps this is genius foresight on the part of fashion sage, Rei Kawakubo, designer of Comme des Garçons and store visionary. Establishing a landmark building as the cornerstone for a retail and arts magnet could jump start Murray Hill into a new hip hub. What did all the garments from Dover Street Market want me to wear on my visit? 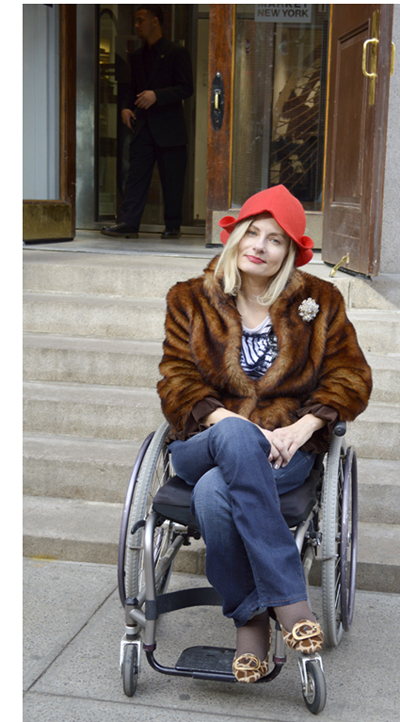 Felt tulip hat by RetroReproHandmade, faux fur by Todd Smith, Red Valentino tshirt, Level 99 jeans and Prada shoes. 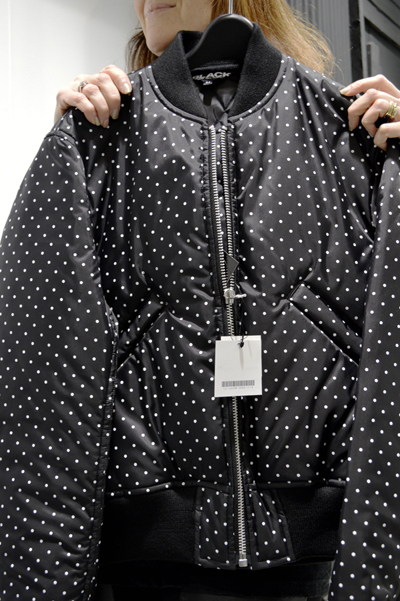 Black Comme des Garçons polka dot flight jacket. 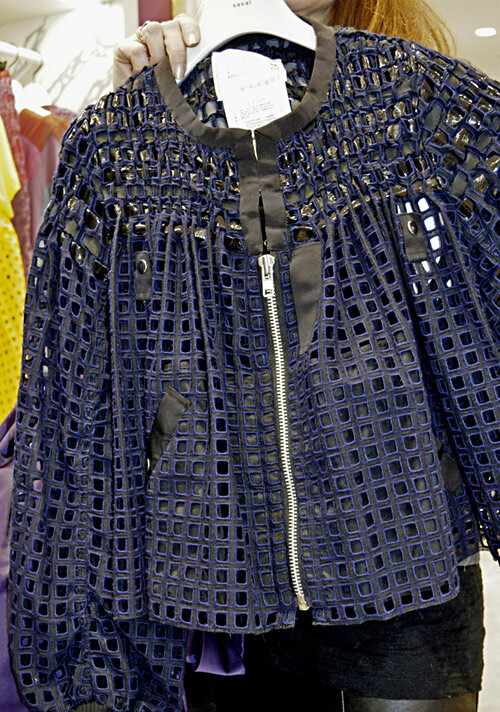 Black Comme des Garçons department. The glass elevator in the center of the store whisked me from floor to floor. 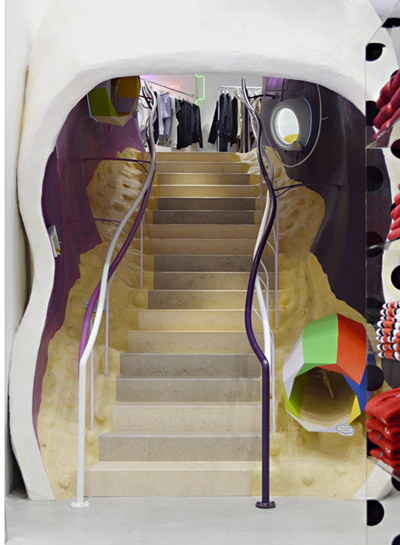 Every floor offers a visual experience which mixes art with fashion, with several areas on each floor merchandised as a store within a store. Each area appeared to me like a meticulously curated fashion installation surrounded by sculptures. The curation and editing throughout the store was very effective. I didn’t feel overwhelmed the way I do when I visit Bergdorf Goodman or Barney’s. The customer service at Dover was superb and exceeded my expectations. The sales staff was so enthusiastic and knowledgeable about all the lines throughout the entire store. 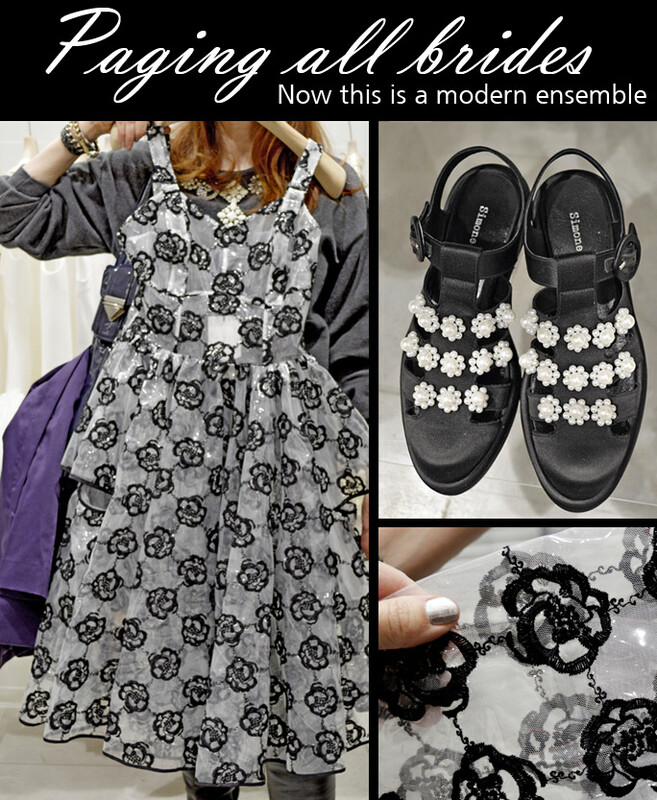 Unlike other luxury stores, the employees are encouraged to dress with their own sense of style, no matter how edgy. I saw body piercings, tattoos, lavender, neon green hair and creative layering of garments. This was New York street style at its finest. Time to shed the popular “I-don’t-give-a-crap-that-I-dress-like-a-lumberjack” look fellas and opt for either of these Comme des Garçons Homme Plus ensembles. Why can’t more men dress like this? Staircase which connects levels 3 and 4. 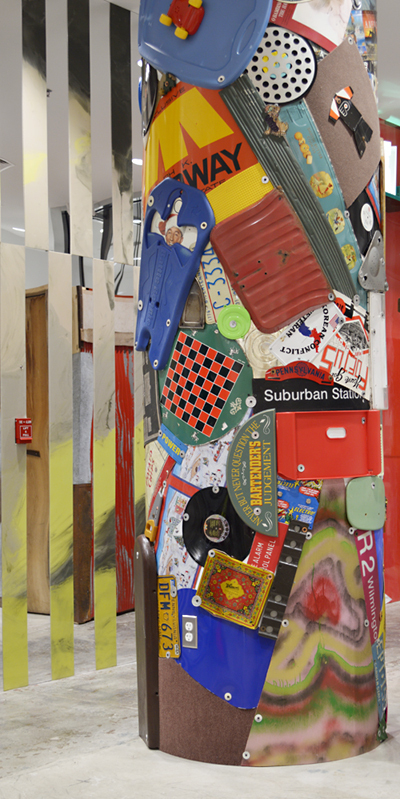 Leo Sewell took common objects and turned a pillar into objects d’arts. Dover Street Market is what Barney’s and Henri Bendel‘s (on W.57th St.) used to be in their heyday. The creativity of clothing, the high quality of workmanship and the store design are of such a high level that a visit becomes a cultural experience rather than a mere shopping expedition. 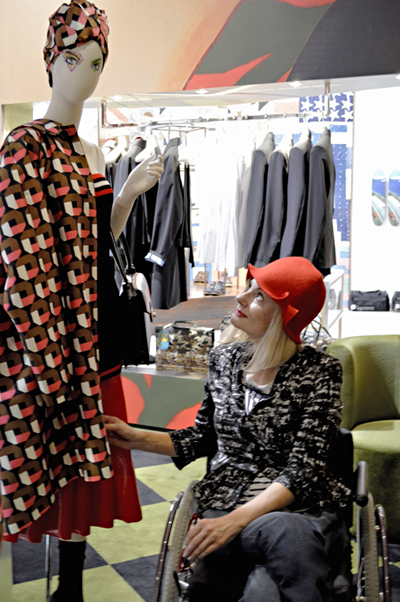 What you see at Dover is wearable art, some of which were created exclusively for the NY branch. 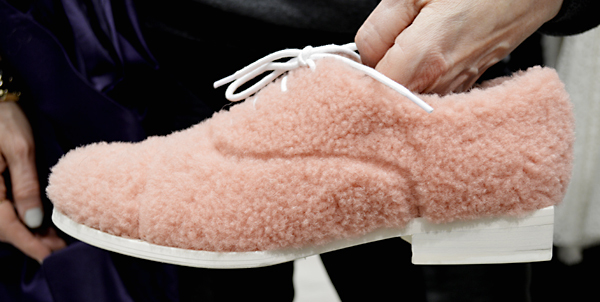 Though I was enthralled to witness what the Comme des Garçons groupies come to gawk, I was more eager to see brands which usually aren’t sold under the same roof–Jacquemus, Sibling, Simone Rocha, Sacai, J.W. 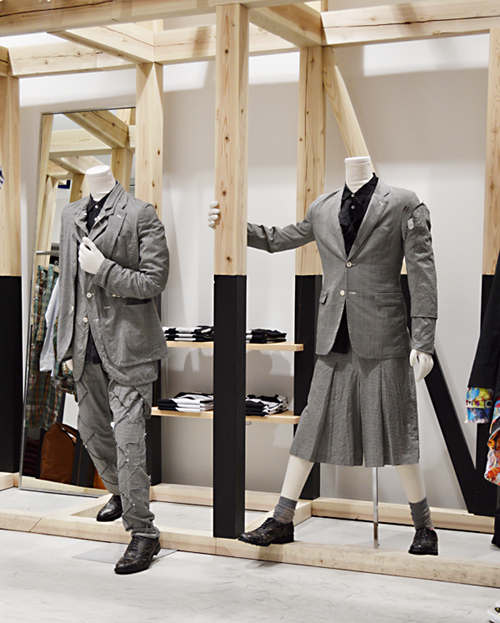 Anderson, Thom Browne and Undercover. My favorite collection and jacket is this one designed by Chitose Abe (who spent years working for Comme des Garçons) for the Japanese brand Sacai. What do you do with an extra bath mat? Recycle it and design a shoe like this swanky pair of charming oxfords by Amelie Pichard. The seventh and top floor is home to fashion’s most coveted and recognizable brand, Prada. 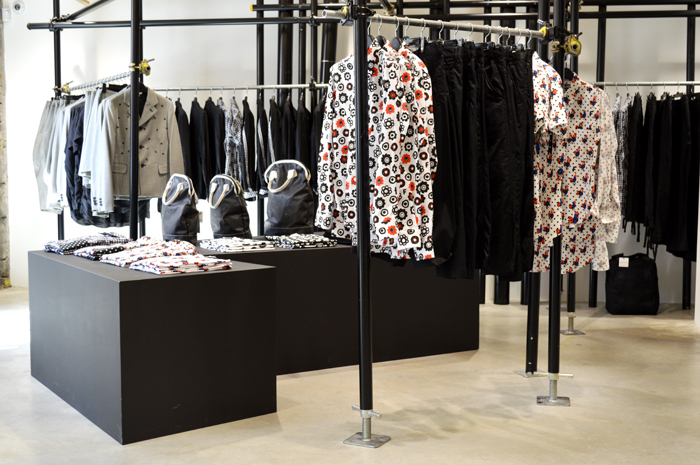 This area and the clothing designs were made exclusively for the store. I loved the way this small space was designed. A salon-like softly lit corner set a quiet, intimate tone, where one could take a breath and admire the mannequins draped in beautifully embellished garments. Back off! Give me space while I serenade this Prada mannequin. I was ravenous after spending several hours shopping, talking, caressing and salivating over the offerings. Thank goodness, Rose Bakery was on the ground floor. This casual bakery/cafe serves a new menu daily with fresh baked breads, sandwiches, salads, quiche, soup, coffee and dessert. This is not your typical franchise style average-at-best stacked slop. And I am always in the mood for a great sandwich. I lunched on a perfectly browned, buttery, grilled brie sandwich with pears, salad and memorable cup of cappuccino. Coffee this good is a welcome treat in a city where the alternative is a cup of Starbucks. At the end of my visit, I was happy to learn that Dover Street shuts it doors for several days twice a year to reconfigure their displays and update their stock. I didn’t see too many customers leave the store with purchases, as the elderly, gabby woman predicted at the store entrance. But I will mark my calendar to return this summer to gaze at the newest designs. Most of the offerings are at high price points, but Rei Kawakubo’s decision to intersperse affordable souvenirs such as the “Play” line of Comme tees with happy smiling hearts, $100 range canvas polka dot sneakers, was a wise decision. There is also a T-shirt line with the Dover Street Market logo and an online shop, which I hope some day will sell more of their designer labels alongside jewelry, tees and sneakers. 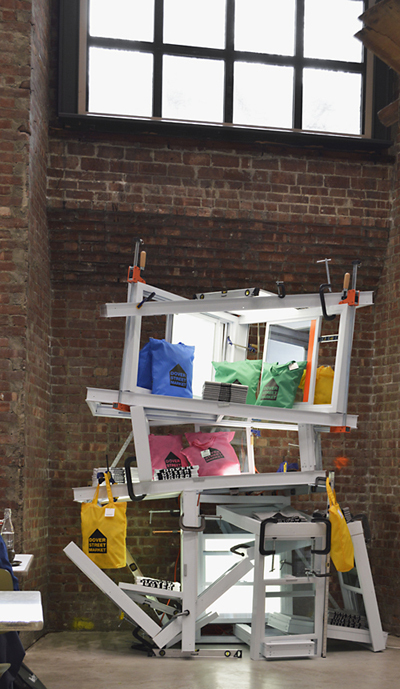 Dover St. Market souvenir display located next to Rose Bakery. You can buy tote bags or tees. 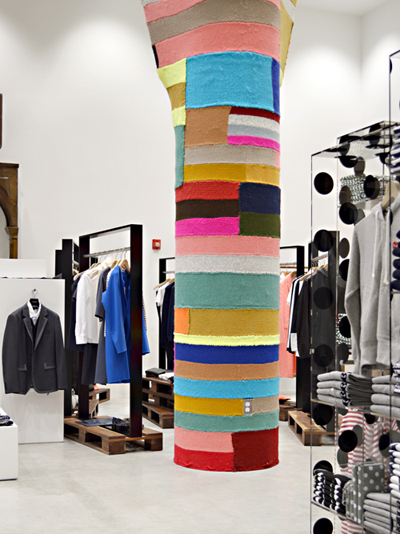 Whether you choose to buy or not, Dover Street Market is worth exploring. Being inspired and savoring designs is my version of a religious experience. I haven’t been this enthusiastic about a new store opening for ages! I used to get a thrill visiting the now defunct Japanese store, Destination, NY, which was located in the Meat Packing District. The space is now occupied by Tory Burch (yawn and Zzzzzzzz.) 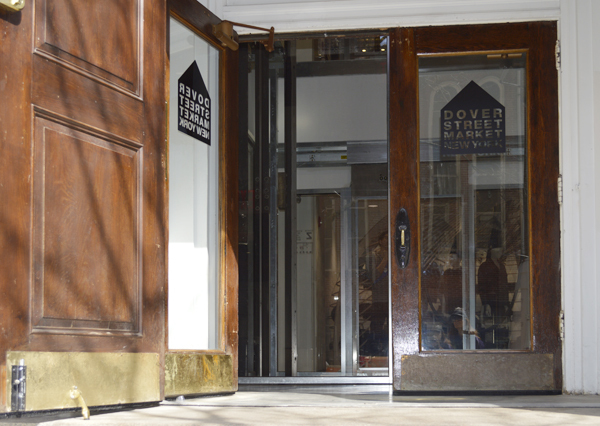 Dover Market Street is retail shopping nirvana, where art and fashion intersect and intertwine. A true New York fashion experience not to be missed. another interesting, educational, enthusiastic, sassy post. you are the greatest!